Peaches don’t raise blood sugar levels excessively and are actually good for diabetes when eaten in small amounts, as part of an overall varied and balanced diet tailored to the individual nutritional requirements of the diabetic patient and the restrictions of their condition. The raw fruit is generally well tolerated in a diabetic diet, provided intake is limited. However, commercial preparations such as jams, juices, peach cobbler, sweetened dried, frozen or canned peaches are best avoided altogether because they raise blood sugar levels too fast too much, predisposing to diabetes complications. Peaches are known to have a relatively moderate carbohydrate content: 9.54 g of total carbohydrates of which 8.39 g simple sugars per 100 g of raw fruit (similar to cherries). And the simple sugars don’t need much digesting since they are already simple, so they get absorbed into the bloodstream almost instantly, contributing to what is known as blood sugar levels. But as long as intake is low, limited to small amounts of the likes of 100 g of the fruit, one small peach (estimated weight: 120-130 g) or even one medium peach (estimated weight: 150 g) per serving, effects on blood sugar metabolism are minimal. What makes peaches good for diabetes is the fact that they are a good source of dietary fiber (1.5 g of fiber/100 g of raw fruit with skin) and have a low glycemic index and glycemic load. Dietary fiber is indigestible plant material that passes unchanged through the gastrointestinal tract but which has the benefit of slowing down the entire digestion process. This helps slow down the rate of sugar absorption from the fruit too, resulting in a steadier, more controlled rise in blood sugar levels which is a good thing for diabetics. The extent to which eating peaches affects blood sugar metabolism is explained by the glycemic index and glycemic load scales. The glycemic index (GI) is a scale that measures how fast the carbohydrates in plant foods raise blood sugar levels. Below 55 is a low GI. Between 55-69 is a moderate GI. Between 70-100 is a high GI. Peaches glycemic index is 42 (low), determined for a serving of 120 g of the raw fruit or the equivalent of one small fruit (according to the Oregon State University and Harvard Medical School). In other words, one small peach isn’t likely to cause extreme fluctuations in blood sugar levels. The glycemic load (GL) is a scale that measures how the carbohydrates in a serving of plant food raise blood sugar levels. Below 10 is a low GL. Between 11-19 is a moderate GL. Over 20 is a high GL. Peaches glycemic load is 5 (low), determined for a serving of 120 g of the raw fruit, or the equivalent of a small fruit. This means eating a serving consisting of 120 g of the raw fruit or a small fruit doesn’t cause extreme fluctuations in blood sugar levels in diabetics. How can you eat peaches with diabetes and reduce effects on blood sugar even further? 1) Eat small servings. Depending on the diabetic patient’s individual tolerance to carbohydrates in food, a small serving may consist of as little as 100 g of the fruit, one small fruit (120-130 g) or one medium fruit (150 g). 2) No more than one serving a day. One small serving has minimal effects on blood sugar metabolism because it doesn’t up your intake of carbohydrates per day or per meal by very much. If you are allowed to eat 45 to 65 g of carbohydrates per meal, 100-130 g of the fruit or the equivalent of a small peach will get you 9.54 to 12.4 g of carbohydrates (of which 8.4 to 11 g are simple sugars). Ideally, see a doctor or a dietitian with experience in diabetic diets for a personalized eating plan that includes recommendations for how much carbohydrates you can eat in a day and per meal. 3) Eating your peach serving separate from other fruit. Adding more fruit is bad for diabetes because it ups your intake of carbohydrates and can cause spikes in blood sugar levels. 4) Never on an empty stomach. Have your serving of fruit after a meal, not before. 5) Best eaten after a low carbohydrate, light protein meal. Avoid fruit if you’ve had a lot of carbs already. 6) Pair with protein and fat. Protein and fat reduce the rate of sugar absorption into the bloodstream. A little cow, sheep or goat cheese, sour yogurt, a few walnuts, sunflower or pumpkin seeds or lean chicken in a warm salad with greens are good combinations. 7) Eat peaches with skin. That’s where a lot of the fiber is and fiber helps manage blood sugar. 8) Choose slightly less ripe peaches. In unripe fruit there is likely more indigestible fiber which contributes to better blood sugar control which is good for diabetes. But it may upset your stomach more. See 7 Side Effects of Eating Unripe Green Fruit. 9) Exercise afterwards to help use up the carbohydrates and prevent spikes in blood sugar, weight gain. Diabetics can eat canned peaches if they are canned in water or light syrup. In any case, check the label for total carbohydrate content to be able to determine how many carbs you’ll be getting in a serving. This will allow you to plan your meals ahead so you don’t exceed your recommended intake of carbohydrates and prevent blood sugar spikes. And remember to only eat small amounts at once, just like you would the whole fruit. 1) Minor benefits for skin and nervous system thanks to a modest, but varied B vitamin profile. May provide some form of protection against diabetes-associated nerve damage and skin damage. 2) Modest source of vitamin C for faster wound healing, a major concern for diabetic patients. 3) Small amounts of vitamin E for skin and cardiovascular health. 4) Helps combat fatigue thanks to a varied B vitamin profile (vitamins B1, B2, B3, B5, B6, B9) and mineral profile (calcium, iron, magnesium, manganese, phosphorus, potassium and zinc). 5) Minor benefits for weight loss from dietary fiber (1.5 g of fiber/100 g of fruit with skin and about 2 g of fiber per one small and medium fruit) and low energetic value (39 kcal/100 g or 50-60 kcal in a small and medium fruit). 6) Antioxidant, anti-inflammatory properties aimed at cardiovascular, nervous system health and other systems and organs. Red peaches have more anthocyanins (red and purple-colored antioxidants), while yellow peaches have more carotenes (yellow and orange-colored antioxidants). 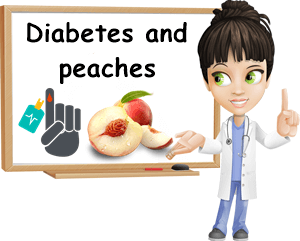 Diabetes and peaches are a relatively good pair provided intake is kept low, according to the diabetic patient’s individual nutritional requirements. Eating the raw fruit, preferably with skin, has minimal effects on blood sugar levels and contributes to better insulin control. Jams, juice, pies, dried and sweetened frozen or canned preparations are best avoided because they tend to be too high in sugar and cause side effects both short and long-term. Raw peaches are a good choice of fruit for diabetes also because of the good nutrition they provide, notably a varied B vitamins and mineral profile, good fiber content, low calorie and fat content, supporting overall good health.